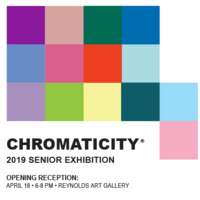 The Department of Art and Graphic Design senior class students at University of the Pacific present Chromaticity, an exhibition of their art and design works in the Reynolds Gallery. The exhibition is composed of graphic designs, photographs, paintings, multi-media and mixed media installations. The junior studio art students’ work will be displayed in "I See You," an exhibition in the Jeannette Powell Art Center. Artists' Reception: Thursday, April 18, 6 - 8 PM. The community is invited to enjoy an evening of fine art, music, hors d’oeuvres and refreshments. The featured senior artists are Mia Arostigui, Becky Cooper, Ashley Johnson, Jason Ramos Millner, Alicia Muiños, Julia Nguyen, Katie Nimmo, Monica Odeh, Jo Read, Jason Del Rosario, Danielle Thomasson and Leila Valencia. The junior artists are Maria Malik and Isabel Enriquez. For more information visit the Reynolds Gallery website, Facebook page, or contact the department directly at 209.946.2241.